So, Happy New Years! I’ve never really been one to party on New Years Eve, even before I had kids. I hate the traffic and I think going out on the streets anytime after 10pm is just asking to either get in an accident or pulled over by the cops (even though I don’t drink and drive). So this year, like most years, we celebrated NYE in the peace and quiet of our home. We picked up a bottle of peach champagne and some orange juice to ring in the New Year with mimosas, which we’ve discovered and LOVE (thanks Mom!). Once Tank was in bed, we both decided to do some gaming. My brother-in-law stopped by for a few minutes, which was pretty nice. He’s in the army and currently stationed in Texas. He was able to get some time off and is in town for a few days. With a limited amount of time off and lots of friends to visit, that may be the only visit we get with him this trip (though I’m hoping we’ll get to see him for the family breakfast on Monday). After he left to go celebrate NYE single style (at a bar), we got back to playing our games. 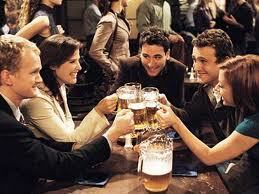 At 11:30pm, we logged off and sat down to watch How I Met Your Mother. Now, I don’t know if I’ve mentioned this before or not, but we don’t have cable, so there was no watching the ball drop. We watched the clock count down the seconds and celebrated. We had our kiss, drank our drinks, and turned on another episode of Mother (we just LOVE this show!). At about 12:20 or so, the Mr was ready for bed and, to be honest, so was I! If we didn’t have Tank with us, I might have stayed up a bit later, but knowing that boy wakes up pretty early, we headed to bed. Being the old folks that we are, we both had more than half of our drinks left. I quickly finished mine, so as not to waste the champagne. The Mr was really tired and his stomach has been bothering him the last few days, so he asked me to finish his, too. I finished both of ours within about 5 minutes, which doesn’t seem that awesome until I tell you we had these in full size glasses, not champagne flutes. Yeah, THAT was fun, ha ha. Sure enough, Tank woke us up this morning the way he always does…he lays on top of you, touches your face, and whispers “I want cereal, please” right in your ear until you get up. Since the Mr let me sleep in yesterday, I’m letting him sleep in today, at least for a little bit. 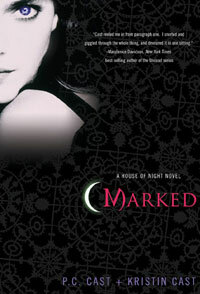 On Christmas, I was given the first book in a series called the House of Night series. While it seems to be geared more toward a younger audience, I did enjoy it and want to get some of the others. I looked on Amazon last night and found 5 of the next books, but decided not to order them. I could find those 5 books for less than $10, but would have to pay $18 in shipping. I simply can’t bring myself to pay almost double in shipping just to get the books, so today, once the Mr is awake, I’m going to take a trip to Bookmans. I’ve got a gift card and I’m hoping I’ll be able to find the next 2 or 3 in the series. I’m keeping my fingers crossed! Question of the Day: How did you ring in the New Year? So last night was the first time we had attended a Tweet Up. If you don’t know, that’s where you get together with a bunch of people you talk with on Twitter and meet each other in real life. Last night was the Bookmans Phoenix Tweet Up. The turn out wasn’t the biggest, the Mr, Tank and I were there, along with one other Tweeter and her 2 kids, and the woman behind the Bookmans Phoenix Twitter account, Yvette, but it was a really fun night. We got to talk about some of the things we’d like to see from them in the future. 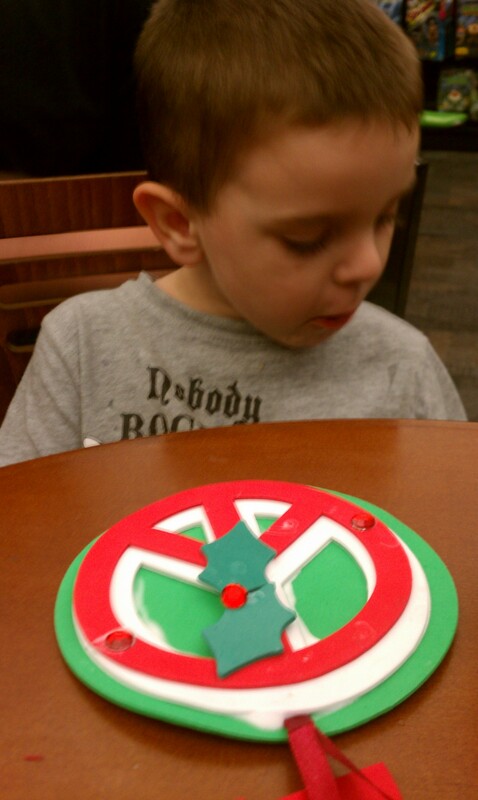 Yvette brought out a craft project for Tank to work on, so he wouldn’t be bored. Here he is, with the finished ornament project. There was also coffee and some great snack from the Bookmans Mesa cafe. By the way, I’m now very jealous of them because those baked goods? Yummy! I should have grabbed a picture, but to be honest, I just forgot. I guess I really need to get the whole picture part of this blog down. Anyway, it was a nice time. We munched on some baked goods, enjoyed some yummy coffee, had a great time chatting with the others, and found out some interesting things about our favorite bookstore. If you’re in Arizona, I strongly encourage you to check out Bookmans. They’re all about recycling and keeping things as local as possible. They also have amazing prices on books, movies, and games. We actually had some store credit from the last time we sold books to them so we picked the kids up some new books. 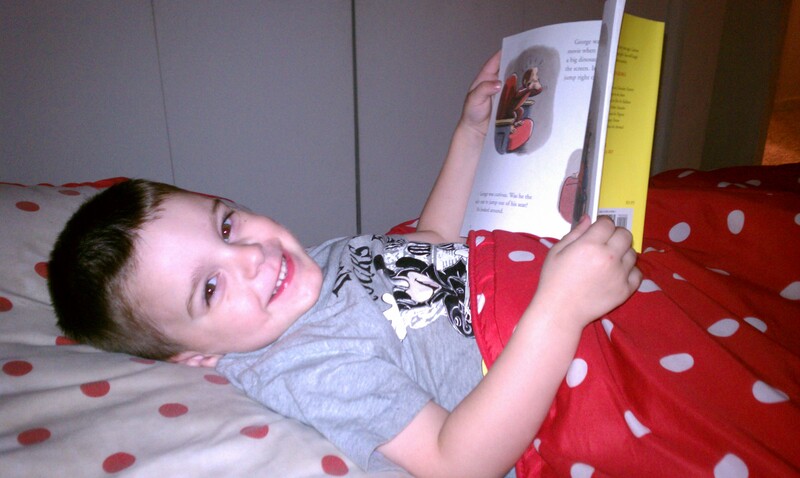 Here’s Tank, reading Curious George for bed. Well, I read the story and then gave him the book, so he could go through it again. That’s what this is. In other news, I just turned on the heat for the first time this winter. Today’s high is supposed to be 65 degrees, with a low of 49. I know it’ll be shut off before lunch, but the apartment is just a little too chilly to do without it. I’m in a sweater, pants and socks and I’m still cold. I’m just looking to take the chill out of the air so I don’t feel like I’m an ice-cube. This year, my joints hurt more than last year, so I’m going to avoid suffering, especially since we have a flat rate on our electricity. YAY! If I chose to make it 90 degrees in here this winter (yuck! ), I could without worries. There are a few advantages to living in an apartment and this is one of them. Alright everyone, I’m going to head out and see about taking Tank for a walk to the pet store across the street. He loves looking at all the animals and I love him doing all that running. Question of the Day: Have you turned on your heater yet? How cold is it where you’re at?